Though the heavy showers and gusty winds on Wednesday gave the impression of a rainy day for Mumbai City, it was just a "normal" July day, with 4/5 heavy showers of limited durations for Mumbai City. The rains were distributed in the day and measured 21 mms at colaba and 46 mms at Scruz, averaging 33 mms on Wednesday. (vagaries' Estimated up to 25 mms. On Tuesday, Delhi Averaged 16 mms,keeping with our estimate of 20 mms, and Pune managed 10 mms . Surat overshot the estimate of 25 mms to 38 mms. In the next 3 days from Tuesday, we see the UAC merging with the Monsoon Axis. But, another Low pops up over Orissa on Friday. Tuesday, Wed/Thursday, we see nothing very unusual on the rain scene. Moderate to heavy rains will occur along a South shifted Axis. Rainfall will be occurring along Gujarat/MP/Chattisgarh/Northern Vidarbha and Southern UP line. Also some thunder showers in Southern Haryana and Orissa. Heavy rains in Orissa from Thursday. Uttarakhand and Nepal get heavy rains on Thursday. Kathmandu, as Neeraj informs, is deficient. With 121 mms in July so far, it has to catch up with the July normal of 363 mms. Days in Kathmandu are at 29c, and nights at 20c. We can expect a slight increase in rains on Wed and Thursday. Karachi may get some showers, in some parts, on Tuesday/Wednesday or Thursday. But rain expected to be light and passing. Nawabshah, Sukkar and Multan will be hot and dry. Nights in Multan may rise to above 30c. Mumbai: Tuesday /Wed/Thurs: Partly cloudy. 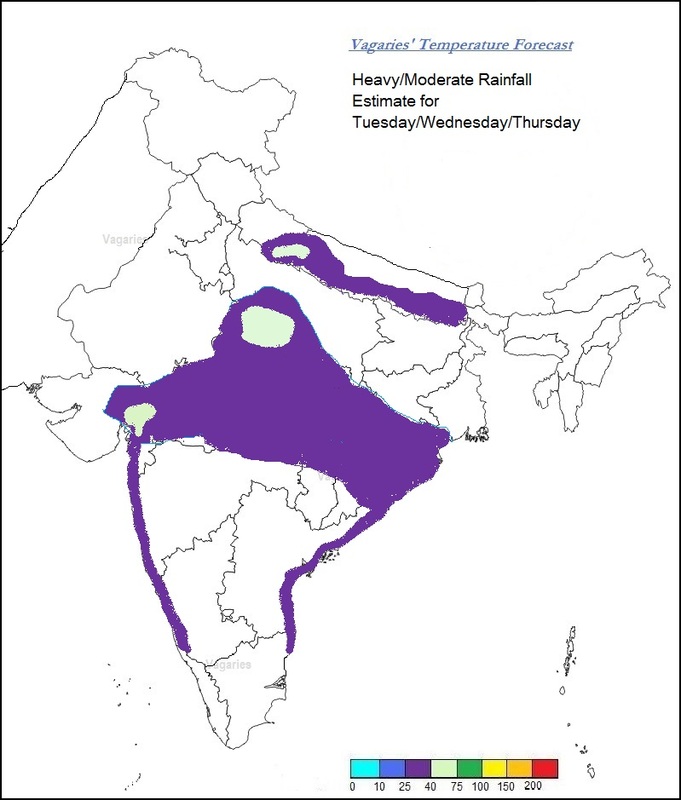 Rains frequency increasing a bit from Tuesday afternoon. 4/5 Passing showers of 10/15 minutes duration between sunny and bright intervals. A downpour in the night .Rain amounts per day will be around 20-25 mms (avg), reducing a bit on Thursday. Gusty and strong winds from W/SW on Wednesday and Thursday. Pune: Rain on Tuesday will measure up to 10-12 mms. Wednesday and Thursday will be light rains in some parts , measuring around 5-10 mms. Chennai: The Thunder shower in the post afternoon period will appear on Tuesday and Wednesday. In some parts , could be heavy and gusty. Surat: Cloudy with some heavy showers. Rainfall around 20 -25 mms on Tuesday, and increasing to >30 mms on Wednesday. Delhi NCR: Chances of Thunder showers on Tuesday and Wednesday evening/night. Rain amounts around 20 mms. A very warm day till 3 PM and followed by very heavy downpour in the night around 9-10 PM..
Rajesh as you mentioned may be this one repeats on tuesday..
yes Rajesh sir, Kathmandu is a bit deficient and my feeling is it will remain deficient this July - maybe by 60 ~ 80 mms . Looking at the nature of rainfall till now - the rain has fallen in heavy bursts now and then, totaling upto 20 or 30 mms for a day, instead of persistent drizzle (which is more normal for July); and rainy period is punctuated by longer drier periods (though mostly cloudy) - for me this is a sing of monsoon current remaining a bit weak here. The days have been cloudy - if not much rainy - and temperatures are moderated. With no clouds, the max temps here in July would climb to around 32 C mark, the minimum temp never climbs above 21 C no matter what - for cloudy rainy nights/mornings its around 20-21 C, for clear cloudless nights/ mornings it would be around 18-20 C.
Today Badlapur was having rain all through the day with varying intensity so nice cool & pleasant weather here. incessant rains over navi Mumbai yesterday, pouring like waterfalls, gusty winds and dark cold...must be more than 100-150mm..
Just wondering if rains over Mumbai will increase or we will have some respite? Navi Mumbai non stop rains. Look's like further downpour is likely in Mumbai and also very wet weekend instored for Mumbai , konkan and Gujrat. Raining heavily in south bangalore for the last 20 min.